Posted on August 14, 2015	by Gill Phillips - Whose Shoes? I love it when I turn up at my mum’s place and she has a glint in her eye and announces “I’ve written a blog”. She then waves her handwritten piece at me and we read it together. I don’t always get round to publishing them – the ones that she wants to publish, that is (!). But I thought I ought to publish this one as lots of people ask how Mum is getting on in her new life, as she adjusts to her new ‘assisted living apartment’, and it has had its ups and downs. Things are not quite as usual HERE. 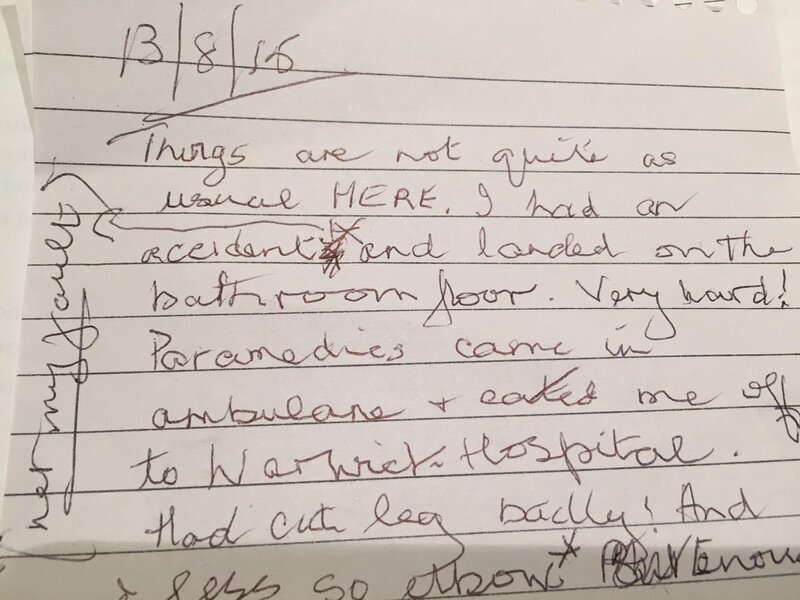 I had an accident – not my fault – and landed on the bathroom floor. Very hard! Paramedics came in the ambulance and carted me off to Warwick Hospital. Had cut my leg badly! And less so my elbow. Bumped head. Enough! Paramedics lovely and helped a lot. Doctors lovely and sent me home at 9pm (about five hours there). Sent me with a nutty cab driver who took me to the wrong place! I got him onto the Warwick road and then guided him HERE! I had given him the right postcode. I know my own postcode. The people at the hospital didn’t give me a chance to order my own taxi – I have one or two regulars. Aches and pains all over from bruises sustained and have to use a three wheeler trolley everywhere (to lean on) but improving daily. Went to Practice Nurse who said it was better than she expected and doing well! Can’t be bad? HERE same as usual. Nice lunches (usually). Didn’t go to Scrabble. Missed it, but it involves a long walk. Something wrong with my hearing aid, must get it sorted. Film HERE tonight but preferred to watch TV (Endeavour). Peter tells me to take more water with it! I wish!! Very surprised and delighted to see Gilly. Very late. She was just back from the ‘maternity review listening event’, via crazy floodlit cricket match. My grandson Alex scored 174. Must tell Brian! I will tell them that I have written a blog too. They don’t seem to know what blogs are. Over and out. This entry was posted in Gill's Mum, Guest blog, health, housing, personalisation, safeguarding, well-being and tagged A&E, carers, choice, choice and control, dignity, disability, elderly, housing, mobility, older people, relationships, Whose Shoes?. Bookmark the permalink. Never mind when we get old – I want to be as independent and selfless (and switched on) as your Mum now! Please give her my love.